Tinder, or, What Fresh Horror Is This? As a single young lady who has learned most of my romantic lessons from novels, I try to keep an open mind! After all, you never know when you’ll be opening a small-town B&B and run into a handsome, brooding stranger. But NYC isn’t full of B&Bs, and I’m not a bakery-owner or a dog-walker, so that limits my dating venues to bars, volunteering (my mother’s recurring suggestion, but that’s a story for another day), or the dreaded dating website. Having exhausted all my matches on OkCupid, I thought Tinder might be the next best thing to a meet-cute! After all, it’s very first-impression based, and my extensive survey of rom-coms indicates that first impressions are everything. So I’ve been swiping left a lot, and swiping right once in a while. I get a small thrill when I see a message notification, but the messages themselves been rather disappointing. Let me tell you, it doesn’t take a professional editor to read between the lines of these messages. One I got last Saturday said “hey. wanna have some fun?” I know what that means, and no, sir, I do not. But recently I swiped right to a very promising young man—handsome, very much my type, with a funny and charming short self-description about being “an old soul,” jackpot! Tinder let me know we had matched, even better! I bit the bullet and sent a message…albeit not my wordiest attempt, it just said “hi there.”Perhaps this was it! The “hi there” that would lead to a witty yet cool response, and a fun first date over drinks, and a million inside jokes we could write into our vows, and babies. A few hours go by, and my phone dings. It’s a message from the single most promising person I’ve seen on Tinder! I open the message, visions of a lovely date with a self-described “old soul” dancing in my head. What will it be? A trip to the bookstore and then ice cream? An indie flick followed by gelato? Well. There you have it. On the bright side, I didn’t have to strain to read between the lines. FINALLY! 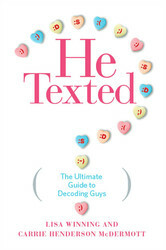 An invaluable guide to dating in the digital age, from decoding Facebook friendships, to reading the intentions behind a guy's perplexing texts, to deciding when (if ever) to text him first.